Cloudy and windy with occasional light rain...mainly in the morning. High 57F. Winds N at 20 to 30 mph. Chance of rain 50%. 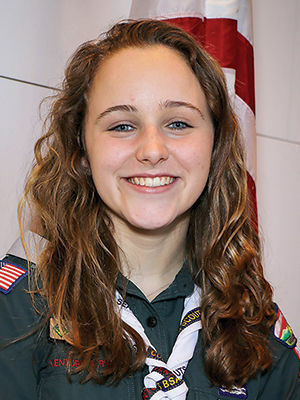 Higher wind gusts possible..
Kirkwood High School student Maggie Pennington earned the Venturing Summit Award and received her award during the Summit Court of Honor on March 17. Pennington is a member of Venturing Crew 981 from Kirkwood. For her project she planned, organized and led the construction of five shelving units to store and enable easy access to donations at Epworth Children and Family Services in Webster Groves. During her time in Venturing, Pennington held several leadership positions including District Venturing President, Crew Vice President of Program, and Crew Guide. She completed National Youth Leadership Training and National Youth Leadership Experience at Philmont Scout Ranch. She earned the Kodiak Challenge badge and Powder Horn Badge. She participated in high adventure activities at Florida Sea Base and backpacked over 80 miles in the mountains at Philmont Scout Ranch. Additionally, Pennington is a member of the Kirkwood High Women’s Cross Country team and Track and Field team.